Bangpa-in Cogeneration Power Plant (here after “the Plant”) which Shinryo Corporation had received the order for the second construction phase of from Bangpa-in Cogeneration Limited started commercial operation in Thailand in July 2017. We were responsible form the design to procurement of equipment and materials, construction, and trial operation through EPCC contract. We were also responsible for the first construction phase of the Plant (completed June 2013) as well. 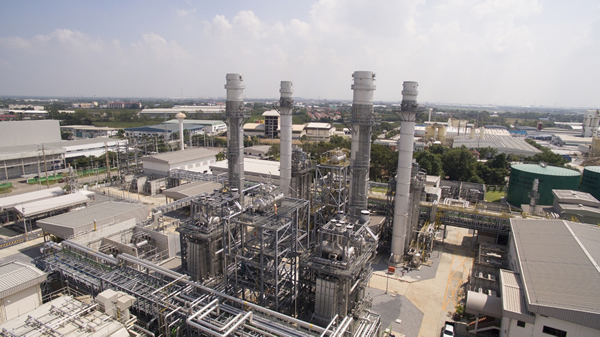 The Plant is one of the power plants included in the SPP Plan*1 by the Electricity Generating Authority of Thailand (here after “EGAT”) which was constructed in the Bangpa-in Industrial Estate in Ayutthaya Province, approximately 50km north of Bangkok, capital of Thailand. The second construction phase consisted from two gas turbines, two heat recovery boilers, and one steam turbine. It has a similar supply capability as the first construction phase and is able to provide 90MW of electricity to EGAT while providing 20MW of electricity and 20t/h of steam to the plants inside the Industrial Estate. Furthermore, it reduced energy usage in the Plant through increasing the efficiency of power generation of gas turbines by 38% and 55% as the Plant in whole. The Plant is contributing in the stable supply of electricity in the Industrial Estate, the development of power generation and power transmission system in the Thailand as well as cleaner exhaust gas and reduction of GHG. We will continue to fulfill social responsibilities through business activities that is rooted in the local region. A program by Thai government aiming to reduce import and use of fossil oil through promoting small scale business operators and increasing the energy usage efficiency by using byproducts of existing power sources and renewable energy.